When Pete R. Pizarro '94 says, "change is something that you have to embrace," he's speaking from experience. As chairman and CEO of The eLandia Group, an information technology and communications services company based in Coral Gables, Fla., Pizarro makes strategic decisions to expand the firm's global partnerships in a shifting marketplace. Before joining eLandia in April, he served for six years as president and CEO of Telefonica USA Inc., increasing the Spanish telecom provider's profitability and market share in the United States, Latin America and Caribbean. 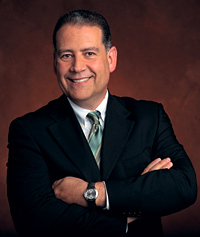 Pizarro's previous executive roles — at Esavio Services Corporation, Nobart Inc. and The Siman Group — established his reputation as a leader who could help companies navigate mergers, acquisitions and other transformations effectively. Growing up in an immigrant family gave him early training for those roles, says Pizarro, who left Cuba for the U.S. in the early 1960s, when he was barely a year old. "Tolerance for change was something that was certainly embedded in our family fabric. We moved to California and then to Miami, constantly looking for a greater opportunity." Pizarro's mother and extended family members, who had been professionals in Cuba, took menial jobs and pooled their resources to make ends meet in the United States. "As a kid, I would help my mother clean offices on weekends and evenings. It was really about survival and adapting to a new culture and language," he says. "Between all the families — aunts, uncles, cousins — everybody really had to come together, contribute and pitch in. I probably learned to like teamwork from that experience." After earning a bachelor's degree in accounting, Pizarro started his career as an auditor at KPMG. In 1992, while CFO of a Chicago-based company, he enrolled in the Kellogg Executive MBA Program to add what he calls a "qualitative" dimension to his already strong quantitative skills. "I wanted to transition into general management and I didn't want to be seen purely as a finance person," he says. The Kellogg curriculum gave Pizarro the training and confidence he needed to be a turnaround CEO. "After graduation, I moved back to South Florida and took over a company that was going into Chapter 11," he recalls. "I was able to restructure that company as its president." Since then, Pizarro has played a pivotal role in shaping the Kellogg School's MBA initiative in the Miami area. He helped choose a location for the Miami Executive MBA campus in Coral Gables and as chair of The Beacon Council, Miami-Date County's economic development organization, he made introductions to influential business leaders. In 2008, he earned a Schaffner Award, the Kellogg School's highest honor for outstanding service by alumni. "Pete approaches every project with a real sense of urgency. He has tirelessly promoted the interests of Kellogg not only in South Florida but throughout Latin America," says Eric Fridman, assistant dean and director of marketing for executive education. Pizarro hopes his contribution helps the school position Kellogg for strategic growth at a time when Latin America — and Miami, its gateway city — are poised for takeoff. Even though he says more progress is needed, Pizarro believes the region has improved dramatically within the last decade, thanks in part to rising commodity prices, a vastly improved investment climate and strong connections to Europe and China. "GDP and per capita income in all of these countries have finally stabilized, so there is tremendous potential for expansion," notes Pizarro, who is alumni co-chair for the Jan. 11-12 Kellogg Centennial Conference in Miami. At the helm of The eLandia Group — which provides integrated IT and telecom solutions to enterprises in Latin America, the Caribbean, the Pacific Rim and Europe — Pizarro has already begun to seize opportunities. He recently secured $130 million in expansion capital and brokered the acquisition of a major technology training company. Within eLandia, he says, "We're creating a foundation that's going to support and drive technology education, to help alleviate the technology skill gap that still exists in Latin America." Companies that invest in educating their workers will gain an added edge as globalization continues. "Although there are great universities throughout the region, they're just coming into their own now," Pizarro says. "Kellogg has a real opportunity to provide world-class, global management education in markets that have traditionally been localized. There couldn't be a better time to be expanding in the region."